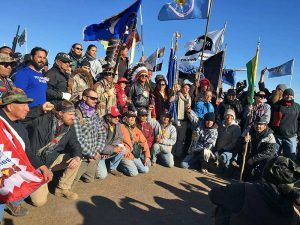 What a privilege it was to go to Standing Rock and witness first hand the courage, commitment, faith and community of conviction that has formed there. One experience I continue to carry and reflect upon was our participation in a meeting to prepare those considering participation in last Saturday’s action. A woman I would guess to be in her mid 20s shared with us her experiences which now total some 45 plus arrests. She has been maced, pepper sprayed, thrown in solitary confinement, subjected to strip searches, tear gassed etc…and she keeps going back. She shared her experiences not to frighten us, but to give people the full facts so that we could discern our participation knowingly. (That day alone, there were 37 arrests from 2 actions.) On Saturday, we Dominicans met the caravan of over 100 cars as they made their way to Mandan for the day’s action. We stood on the side of road blessing them, cheering them on and praying for their safe return. Thankfully, this time, they did return safely. No one was hurt. No arrests. Upon their return, a prayer was held around the sacred fire and those in the camp were invited to thank the courageous ones who had put their lives on the line; young, old, in between, native, black, white, Canadians, Swedes, US citizens. As I offered my thanks, my eyes welled with tears. I felt so inspired and so deeply humbled. Various people shared their sincere gratitude for our presence, our support. “You sisters rock!” “It was so great to see you on the road.” “Your support was a real shot in the arm.” One native woman issued an invitation and what I heard as a challenge. “Come join us next time.” I pray that I may someday have the courage to do so. What a grace to have been able to witness their faith in action.